We’re going to briefly interrupt Shanghai Scrap’s non-stop Expo 2010 coverage to announce that – based upon what we just had for breakfast – Starbucks is doomed. For those who don’t follow the venerable coffee company, it’s been faltering for several years now, largely due to over-expansion into questionable markets in the US (though that appears to have been reversed in the last quarter). The only bright spot has been China, where the company operates 376 stores and – according to CEO Howard Schultz – it has plans to open thousands more. 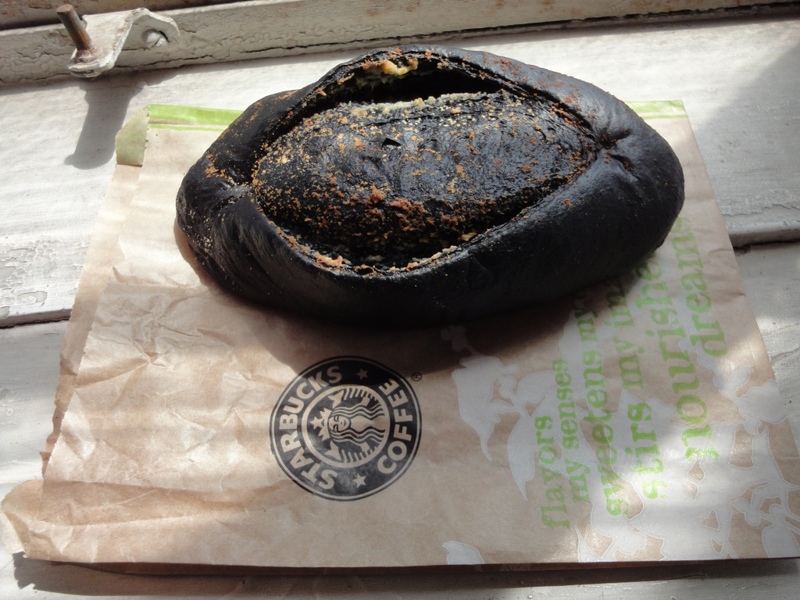 It won’t be easy, though, as he readily acknowledged last week: “[I]t’s a complicated market that requires significant discipline and thoughtfulness.” Exhibit #1 in the lack of discipline and thoughtfulness category: Cuttlefish Cheese Bread, now available at the Starbucks up my street. Click the photos to enlarge. In case the photo doesn’t make it clear: the bread is blue. Now it is very much the case that several American fast food restaurant chains have done well in China by localizing their menus (KFC being the undisputed champion in that category). But this isn’t localization; this is just someone saying, “We like bread and cheese; Chinese people like cuttlefish. 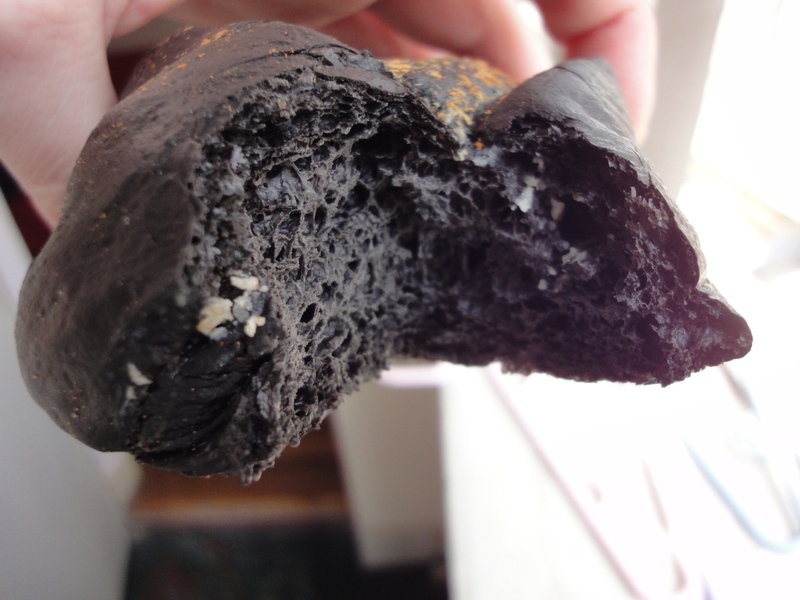 So … cuttlefish cheese bread! We’ll make a fortune!” Given, that would be the case if there was anything remotely appetizing about cuttlefish cheese bread. 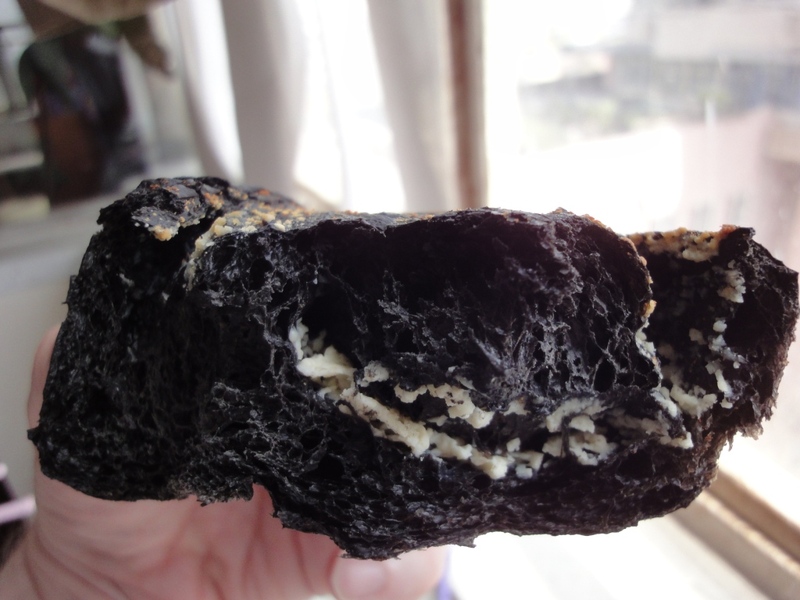 Or, as my friend Jarret Wrisley (regular contributor to the Atlantic’s Food Channel, and soon-to-be Bangkok restaurateur) tweeted earlier: “Squid Ink? Cheese? Coffee? Yuck.” Short the stock. 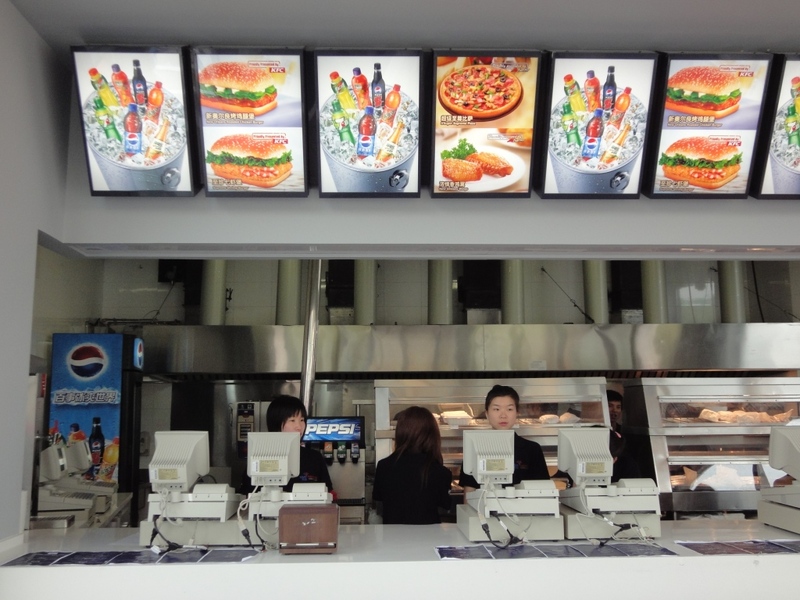 Last week I posted several photos of the North Korean Expo 2010 pavilion to some mild interest from the North Korean aficionado community (oh yes there is), worldwide. At the time, I must admit, it didn’t occur to me to post images of the South Korean pavilion because – from the perspective of a US citizen – the North Koreans are just so much more interesting. That, and the South Korean pavilion – unlike the North Korean one – wasn’t open during the soft opening. Apparently, this did not go without notice, and so – while life was continuing apace for everyone else – I received a deluge (okay, six) emails asking me why I didn’t give equal time to the Free South (with three coming – suspiciously! – in the last 90 minutes). 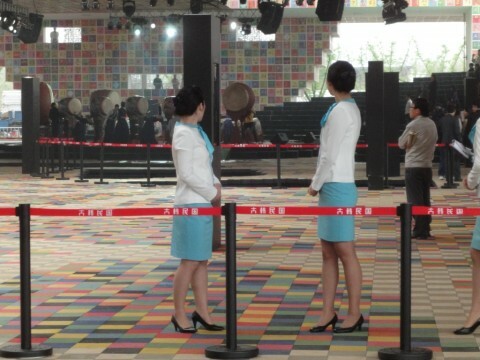 Fair enough: below, an image taken of a musical rehearsal (in the background) in the South Korean pavilion during the soft opening, earlier this week. Again, I would’ve posted more and better, but the pavilion wasn’t open to visitors during the soft opening. Still, this image should offer some sense of the exquisite beauty that is the South Korean pavilion. And, at that, I’m going to pass out from Expo fatigue. Meatier material, tomorrow. “We got yer pizza …” American cuisine well-represented at Expo 2010. Not exactly something for everyone, but certainly something for anyone who doesn’t feel like walking over to the nearby Papa John’s or Burger King. At an optimistic minimum, the menu should provide a good lesson in the forces (forces like USA pavilion sponsor Yum, Inc., owner and pusher of KFC and Pizza Hut) that Michelle Obama has to overcome in her high-profile campaign against childhood obesity. Presumably, if and when she and the kids visit, they’ll pack a picnic. A friend just emailed to remind me that I once promised my readers that I would never again post three consecutive Expo-related items to this blog. Here at Shanghai Scrap, we keep our word! And though the next Expo-related post isn’t yet ready to be pushed out the door, I thought I’d better offer my reassurance to any and all who thought that I might be on the verge of the dreaded Expo hat-trick. Also, I’m a little tied-up with other projects at the moment. If you follow my tweets, you already know about this. But if not, well, here’s the deal. Yesterday, for reasons that I’ll explain in coming days, I stopped into a local Häägen Däzs. 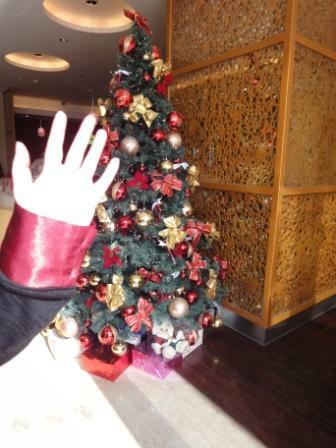 While there, I decided to take a photo of the store’s large Christmas tree. As I did so, I was gang-rushed by a rabid employee who succeeded in blocking my shot. Below, the photographic evidence. I was asked to leave, and when I argued the point, I was pushed out. Now, I don’t want to make more of this than really should be made of it. But, I can’t help myself and note that during the several years I’ve covered religion in contemporary China, I’ve never once been gang-rushed out of a church, mosque, or temple for taking a photo. And that raises a question: just what kind of jack-booted thugs have been hired to train/traumatize the beleaguered ice cream workers of Häägen Däzs? Thankfully, I don’t have to worry about it: there’s a Dairy Queen just up the street, and they didn’t argue when I took a picture of their Christmas tree. Let the boycott begin. [SECOND 12/24 UPDATED: A friend just reminded me of a July 2005 Häägen Däzs in China story that I did. 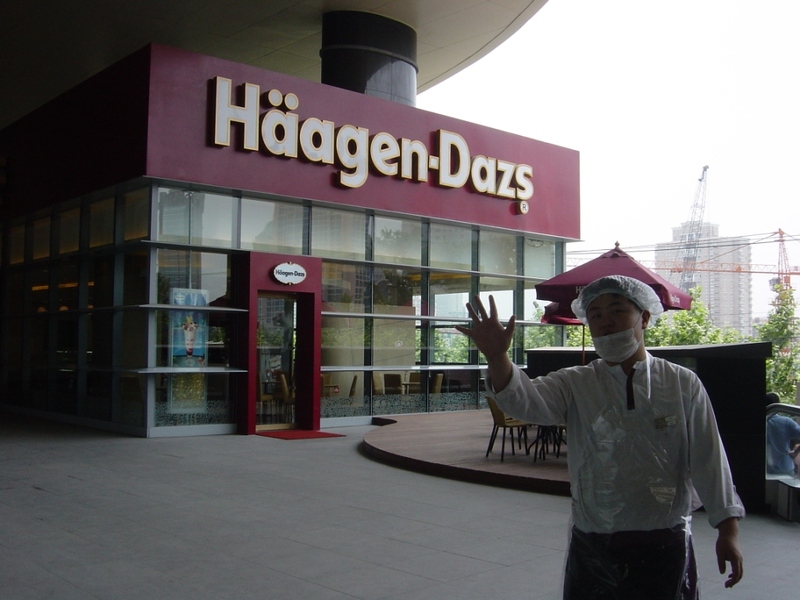 You can read it here, but the relevant fact – for the purpose of this post – is that a Häägen Däzs employee tried to prevent me from taking a photo of a Shanghai store’s exterior. Don’t believe me? Then click the June 23, 2005 image, below, to see the masked ice cream man come chasing out of the store, hands waving. Just what kind of paranoid dictatorship is at work inside that high-end ice cream empire? For the next day or so I’m lost in a sea of acronyms, terrific street food, and unexpected good fortune. Posting resumes on the weekend, I believe. In observance of the Thanksgiving Day holiday, Shanghai Scrap will be on hiatus until November 30. 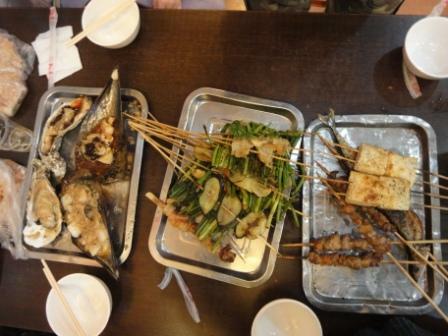 Except that, on Thursday, we’ll make a point of posting an image of what our Shanghainese Thanksgiving dinner looked like (though it won’t be Shanghainese food). And since it’s Thanksgiving … sincere thanks to the ever-growing number of people who stop by, subscribe, and comment on my blog. I really appreciate the interest, and I’ll continue to do my best to earn it.